The view from my large balcony overlooks the trendiest part of the city. I like to sit there at sunset with a cool drink and watch the hustle and bustle of Chiang Mai. There are flea markets in the distance attracting a great crowd and delicious noodles stalls alive with business. The supersized Christmas tree in the courtyard of the luxury shopping center is also in view. But all that is secondary to my most treasured sight, Doi Suthep, a sacred mountain with a golden temple that is lit up and almost floats magically in the dark sky, when the moon rises. I often vacationed in Chiang Mai and other parts of Thailand. 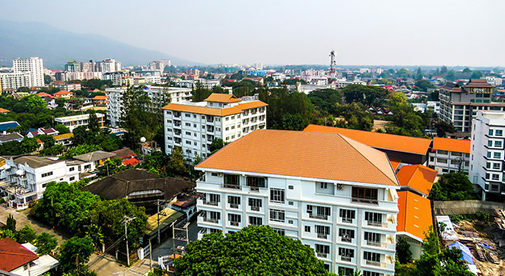 For one of my two-week holidays I rented out a condo in the Nimmanhaemin district of Chiang Mai. I fell in love with the location, close to amazing street food, a major mall, and those views of Doi Suthep with the glowing golden temple. I couldn’t get it out of my mind. I kept an eye on that apartment building online. I loved dreaming about staying there. By sheer chance on my next holiday to Chiang Mai I saw one of the apartments for sale. It was only five doors down from the one I had rented before. I booked an appointment with the real estate agent. It was a simple studio with a large balcony. It was an older building, but the advantage was that I could get more space at a lower price. My husband was pretty skeptical when I called him to discuss buying a property in another country. Somehow I convinced him and I sent what was a combination of some savings and a small inheritance. Transferring the money to a bank in Thailand was really the most complicated step. It was an easy transaction and within a few days I had the keys to my new condo in Thailand. I won’t lie. I won’t pretend now that I knew then I was about to hit the jackpot… I was unaware that I was buying in what was to become a very popular area. This condo, which began as just a small vacation place, very quickly turned into an income stream. My condo is never empty. I only paid $28,000 back then, but have rented it out for around $400 per month ever since whenever we are not using it. In the high season, I often charge more. Sure, I had to do a little work on it. I put in a king size bed, created a lounge area and a small office. I filled it with Thai art work and it has such a great vibe. The building has a lovely pool and large gym for clients to use. We loved holidaying in our condo so much that we began to psychologically move to Thailand. My confidence grew. We managed to save a little more and bought another condo, a little smaller but for around the same price. This condo is on the trendiest street and we rent it, too. It is also never empty. The location ensures a steady supply of renters. The biggest gift of all was that we ended up moving to Thailand permanently. The simple step of buying that first condo meant we slowly re-evaluated what we wanted from life. We realized the possibilities and opportunities that open up to you when you look overseas. My family joke about our Southeast Asian property “dynasty” but it really began so modestly and it has made all the difference. The inner city townhouse that we now live in still has a view of Doi Suthep, I couldn’t have it any other way.